To achieve any of your goals, you need to be really determined and consistently put in your best efforts in your journey. Overcoming self-doubt is crucial in this process. There will be a lot of times when you will face obstacles in your way. If you keep doubting yourself, you will not be able to deal with them properly and move forward. Continuously doubting yourself prevents you from reaching your full potential. How will you make progress if you let self-doubt take over you and become unsure of yourself? If you want to keep improving yourself, then you must overcome self-doubt. 1. You become more confident. Being more confident about yourself provides you with a positive mindset which enables you to believe that you can indeed achieve your goals. It allows you to take advantage of the opportunities around you. When you are confident that you can achieve your goals, you work accordingly. Instead of being inhibited due to self-doubt, you feel ready to take the necessary action to make your dreams come true. Being confident allows you to have a better self-esteem and it positively affects the way you present yourself. Feeling confident about yourself is important for your personal growth and building better relationships. 2. You don't get easily affected by the negative comments from others. "She thinks I'm not good enough, there could be some truth in that." "Maybe I'm don't have what it takes to be successful." Thoughts like these are detrimental to your self-esteem and negatively affect your performance. When you are so preoccupied with self-doubt in your mind, any negative remark from somebody else will easily trigger your low self-esteem and make you feel unworthy. But when you overcome those doubts, you won't let anyone affect you in a negative way. 3. You don’t give up easily. Doubting yourself is pretty natural when you are trying out something you have no idea about. You wonder if you would ever succeed in this new endeavor. When you let your self-doubt take over you, you tend to avoid trying out new things and pushing yourself out of your comfort zone. The what-ifs and worst case scenarios in your mind prevent you from focusing on your goals. And, not doing what you want to do and passing up valuable opportunities leave you with regret. As a result, you get miserably stuck in a vicious cycle of self-doubt and regret. But when you pass over the initial hurdle of overwhelming self-doubt, it will become much easier for you to move ahead in your journey successfully. By overcoming chronic self-doubt, you stay focused on your goals and work until the finish line. You won't get so overwhelmed by the mistakes you make in the way. They are hard to accept, but you learn to pick yourself back up and continue with even more determination. The fear of failing, making a fool out of yourself, or making mistakes is what keeps you from even trying. In those moments, think about what will happen if you actually succeed in achieving your goals and always keep that in mind. You can achieve your goals if you believe you can. Replacing "I don't think I can do this" with "I will do this", makes all the difference. Believing in your abilities allows you to move forward in your journey. Giving yourself credit for trying and celebrating even the small wins in your life is a great way to overcome self-doubt. It allows you to work on your goals more effectively. 5. You take more risks. Overcoming self-doubt allows you to take more risks, try out something different more often and seize the opportunities you come across in your life. Whenever you are trying new things, don’t just automatically assume it is absolutely difficult and you won’t be able to do it successfully. Because when you do that, you undervalue your skills and abilities and end up undermining yourself. Instead, try to approach the situation objectively. Tell yourself that you can and will do it. Continuously doubting yourself prevents you from trying something new and pushing yourself out of your comfort zone. Like any other negative emotion, i.e., anger, envy or fear, self-doubt is inevitable. You will experience it at various phases in your life. It is not practical to think you can absolutely get rid of every speck of self-doubt. But you can definitely work on overcoming excessive self-doubt. The kind of self-doubt that stops you from feeling secure about yourself and taking any initiative at all. 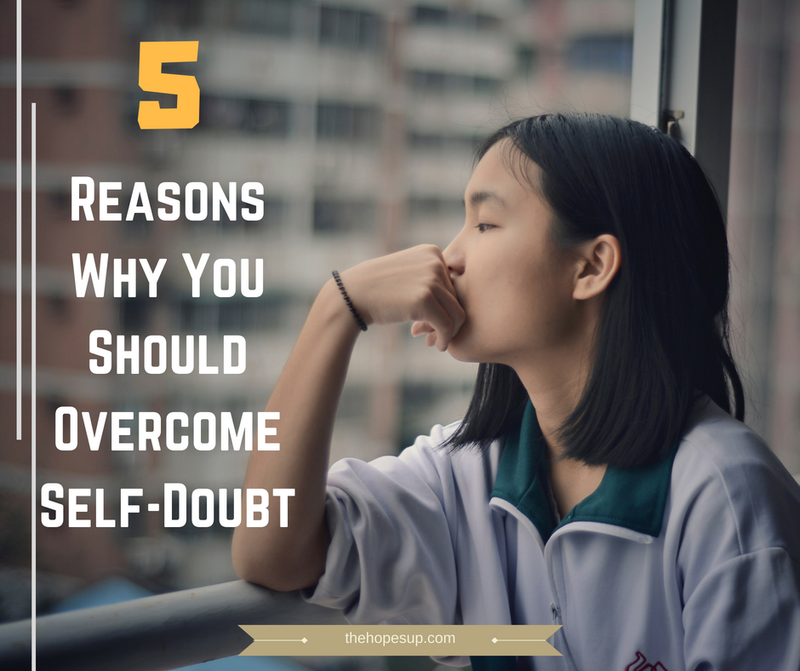 Getting past those doubts is certainly easy, but the satisfaction you get from overcoming self-doubt and achieving your goals makes it worth it. What are your strategies for dealing with self-doubt? if you found this article helpful, don't forget to share it. I tend to think that good things will happen to everyone else, but not me. I think that I'm going to remain stuck, work a dead-end job my entire life, etc., instead of thinking, why not me? Negative thinking is tough to overcome. Thank you for this post! I'm happy you found this post helpful. A lot of things aren't in our control, but we can certainly control ourselves and our reaction to the situations we face in our lives. Excessive self-doubt makes it more difficult to deal with such situations as it results in inner conflicts. Believe in yourself, keep improving yourself and you will surely overcome negative thinking. All the best!